Once the cold weather starts to head out and the warm breezes roll in, comfort food takes a back seat to fresh ingredients. This prosciutto salad recipe is not just any salad with prosciutto. This one packs a long list of vegetables and proteins, so it won’t leave you feeling overstuffed but it will surely fill your belly. Plus, you’ll be glad to know that you’ll be getting most of your daily requirements in just one meal. To guarantee this prosciutto salad is a success, make sure to cut or buy the thinnest slices of Prosciutto di Parma and the freshest produce. In a large bowl, combine eggs, garbanzo beans, celery, onions, red peppers, broad beans, celery leaves, olives, currants and pine nuts. Chop 2 slices of the prosciutto; add to bowl and toss. In a small skillet over medium heat, toast fennel, watching carefully, until fragrant; remove to a small bowl. In same skillet, over medium heat, crisp remaining prosciutto. Remove to paper towel. In the small bowl, whisk in lemon juice, olive oil, lemon zest, pepper and salt to the toasted fennel. 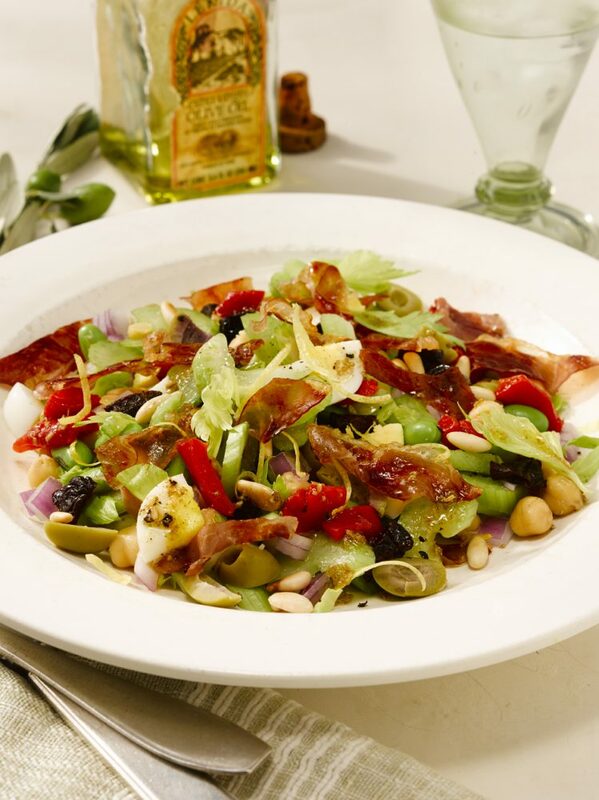 Add dressing to the salad along with crisped prosciutto; toss lightly and serve.